If you received this from someone else, or unformatted, visit our subscribe page to receive this newsletter directly. You can have this translated into your preferred language by using our convenient translation facility located on the right-hand side of the page. Ven. 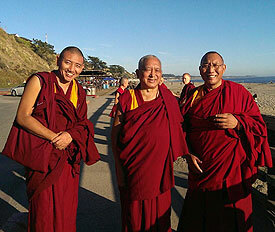 Tenzin Gyeltsen, Lama Zopa Rinpoche and Dagri Rinpoche going to the ocean to bless sentient beings, Aptos, California, USA, October 2013. News from FPMT Charitable Projects: Money for 750,000 Sera Je Food Fund Meals Raised! Crowdfunding Enables New Translations to be Published! Lama Zopa Rinpoche cooking, Buddha Amitabha Pure Land, Washington, USA, 2004. “The initial reason why people come to a Dharma center is not for the food but for the teachings and meditations; they are a little bored with the lives they have and are looking for something new. However, the conditions at the center, and especially the food, are a very important support for the teachings and meditations. Sometimes in the past when I would teach on impermanence, the hells and the eight worldly dharmas, people would get scared and leave; but if the food was good, they would stay. That’s one way to keep them! 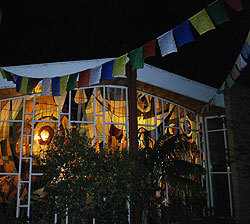 Tendil Nyersel prayer flags at Tara Institute, Australia, 2013. Photo courtesy of Tara Institute. Thanks again to all who have been doing the practices requested for Lama Zopa Rinpoche’s health and long life. We will offer Rinpoche the final count of these practices at the official long life puja to be offered to Lama Zopa Rinpoche on December 9 at Kopan Monastery, following the one-month November course. So please ensure that you have sent Center Services your totals no later than December 5. To donate to the long life puja for Lama Zopa Rinpoche, FPMT centers, projects and services can make their annual donation via the secure site listed under Further Resources in the FPMT Affiliates Area. Individuals can donate here. FPMT centers, projects and services, please send by November 18 your photos of hung Tendil Nyersel prayer flags for a planned photo story in Mandala! And in the meantime, we invite all to rejoice in the practices done so far! Subscribe to our RSS feed on Rinpoche’s Schedule to receive updates automatically as soon as they are available. His Holiness the Dalai Lama and Lama Zopa Rinpoche, Dharamsala, India, March 2008. Photo courtesy of Private Office of HHDL. Every year FPMT contributes to a long life puja being offered to the organization’s great source of inspiration, His Holiness the Dalai Lama. The next long life puja will be offered after the Jangchub Lamrim teachings in India in January 2014. 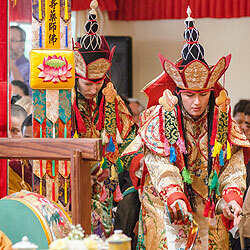 FPMT centers, projects and services can make their annual donation to the long life puja for His Holiness via the secure site listed under Further Resources in the FPMT Affiliates Area. Individuals can donate here. Lama Zopa Rinpoche has been diligently working on a complete daily practice for students for several years. We are very pleased to announce that this advice, Daily Meditation, is now available. This essential practice is the basis of what students, from new to advanced, are advised by Rinpoche to undertake as daily practice. This new Daily Meditation is a revision of the morning prayers included in Essential Buddhist Prayers Volume 1. This meditation includes a new version of the prayer A Direct Meditation on the Graduated Path, Containing all the Important Meanings translated by Lama Zopa Rinpoche, as well as a new translation of verses selected from Shantideva’s Bodhicharyavatara by Rinpoche. Other additions and new arrangements have been made to this meditation – it is a unique new practice by Lama Zopa Rinpoche. Available now as an eBook (non-reflowable PDF), a small beautiful hard copy is forthcoming soon. Money for 750,000 Sera Je Food Fund Meals Raised! 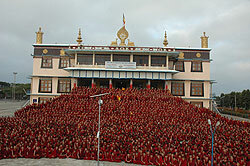 The monks of Sera Je Monastery who benefit from the Sera Je Food Fund. Photo courtesy of the Sera Je Food Fund photo gallery. Tremendous thanks to everyone who participated in the recent Sera Je Food Fund Campaign. Please rejoice: due to the kindness and generosity of many, we raised just over a quarter of the food fund’s annual budget. That’s more than 750,000 meals provided to monks studying at Sera Je Monastery. You can learn more about what it takes to offer three meals a day to the 2,500 monks of Sera Je Monastery and keep up on all news related to the Sera Je Food Fund. FPMT International Office have just implemented a new donor management system and payment processor. Our previous system was discontinued and we have been working hard this year to move over to a new and better system. We are happy to introduce my.fpmt.org. We invite you to register an account on my.fpmt.org, which we will link with your donor record and which will then allow you to view your donation history and active recurring donations, update your contact information and email preferences, and support FPMT with new gifts. We hope you will visit the new site soon and set up your new user account! Please note that this account is for your donations and payments to FPMT International Office and is separate from any accounts you might have set up with your local center or with other FPMT projects. Dakini dance during long life puja for Lama Zopa Rinpoche, Land of Medicine Buddha, USA, September 2013. Mandala magazine brings the vast and dynamic world of FPMT directly to your mailbox. To receive the next print issue of Mandala, sign up now to become a Friend of FPMT at the Foundation Friends level or higher. In our next print issue, we report on the successful 100 Million Mani Retreat in Mongolia with Lama Zopa Rinpoche and share inspiring stories of practices being done for Rinpoche’s good health and long life. Don’t forget to visit Mandala online for the latest updates on Lama Zopa Rinpoche and FPMT centers, projects and services worldwide. Sign up now to Friends of FPMT. Get connected with the international community, support the organization, and get lots of resources for your Dharma path. Learn more! Lama Zopa Rinpoche’s advice (see above) is excellent for any center, project or service which serves food to students and/or has a café. Please see our new guideline: Successful Induction of Board Members. This is designed to help center, project and service board members (also known as “trustees” or “executive committee members”) be fully familiar with their responsibilities and key FPMT policies and guidelines. It is located in the FPMT Affiliates Area/Center, Project and Service Management/Boards and Management Committees. Thanks to Tong-nyi Nying-je Ling, Denmark, on whose successful good practice the guideline is based. Merit Box grants are intended for projects, centers, services and initiatives that further the mission of FPMT. If interested, please contact meritbox@fpmt.org to request a grant application. Enjoy your Lama Chöpa practice with a 15% discount on Lama Chodpa Meditation Incense, hand-made to the exact specifications of an ancient recipe. All ingredients are blessed. One ingredient is blessed in a nine-day ceremony for 12 hours a day by 200 monks. Afterward, it is placed in a Dharma protector room to be blessed once a day for an entire year by a meditation master before being used. Discount available while supplies last. Even though we are living in a world ruled by ignorance, greed and aggression and rife with every type of suffering imaginable, a world that is for many the worst of times, for us it is the best of times. We have received not only a human rebirth but a perfect human rebirth, which gives us every opportunity to practice Dharma to the fullest possible extent. In this book, The Perfect Human Rebirth: Freedom and Richness on the Path to Enlightenment, Lama Zopa Rinpoche explains in the greatest possible detail just how precious this opportunity is and why we should not waste a moment of it. Like the other books in the FPMT Lineage Series, this volume will be a treasured resource for those meditating to receive lam-rim realizations, for those teaching the lam-rim to others, and for all wanting to get a deeper understanding of the Buddha’s teachings and how they benefit all beings. Available from the Lama Yeshe Wisdom Archive at the end of November! Ediciones Mahayana, the non-profit publishing house of the FPMT Spanish Translation Service, is delighted to have raised the funds needed to publish two new books via a successful crowdfunding campaign! The books are La vida del bodisatva by Shantideva and Prácticas iniciales de Vajrayoguini: sadhanas y comentarios. Also, La práctica de Vajrasattva is available this month, and due to the kindness of two sponsors El sutra del cortador vajra and a traceable edition of El sutra Tse Dö have been published. These books (and more) are available in all Spanish FPMT centers and in Ediciones Mahayana’s online shop. The first FPMT Foundation Service Seminar for some years (previously known as FPMT Foundation Training) has been successfully completed! The seminar drew more than 40 people from 17 countries for five full days of sessions on skillfully offering service within the FPMT mandala, plus three days of “train the trainer,” so that qualified trainers will be able to provide the FPMT Foundation Service Seminar in their home area. In this way, we will be able to share inspiration and guidance on skillfully offering service with hundreds of people actively engaged at FPMT centers, projects and services around the world. 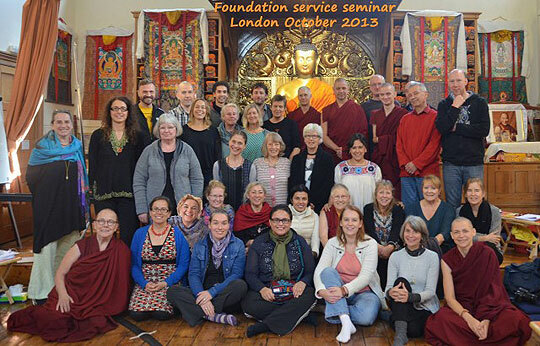 Foundation Service Seminar, Jamyang Buddhist Centre London, October 2013. Photo courtesy of Tara Melwani’s Facebook page. Tushita Meditation Centre, Dharamsala, India is seeking a director.